Our Team Can Repair It. We Also Fix Circuit Board Issues. Call Today! 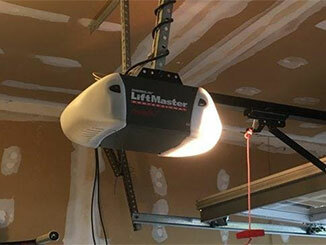 A garage door opener uses electrical and mechanical components, and from time to time problems are bound to pop up simply because of the complexity of this device. So if you find your motor unit isn't working properly all you have to do is reach out to our team, and we'll send our experts over to fix the problem - whatever it may be. Because there are so many components that can malfunction, it's sometimes difficult to know which one is causing you problems. But you don't need to worry because our opener troubleshooting experts will quickly and thoroughly examine the whole mechanism from the motor to the trolley carriage. Once we've identified the reason for that mechanical problem we'll either repair the part that's damaged, or replace it with an entirely new part of the same or higher quality. Many different things can go wrong: motor gears can wear out, drive chains can snap and sometimes even the trolley can break. Whatever the problem, you can count on us to fix it. Your garage door opener isn't just a mechanical device: its electrical components can suffer from wear and tear too. If the circuit board malfunctions, the whole unit can either behave erratically or stop working completely. Photo eye sensors can get out of alignment, or their wiring can become frayed. This can lead to your door reversing unexpectedly, for no apparent reason. You can trust our experienced team to find the source of the electrical problem, provide the right solution for it and return your opener to its proper working condition as fast as possible. Besides repairing these units, we also install them - so if you're in the market for a reliable chain driver opener from LiftMaster or an ultra-quiet belt drive model from Genie, for example, we're more than happy to help. We also work with many other major brands, so contact our team at Garage Door Repair Leander today to get all the help you need.